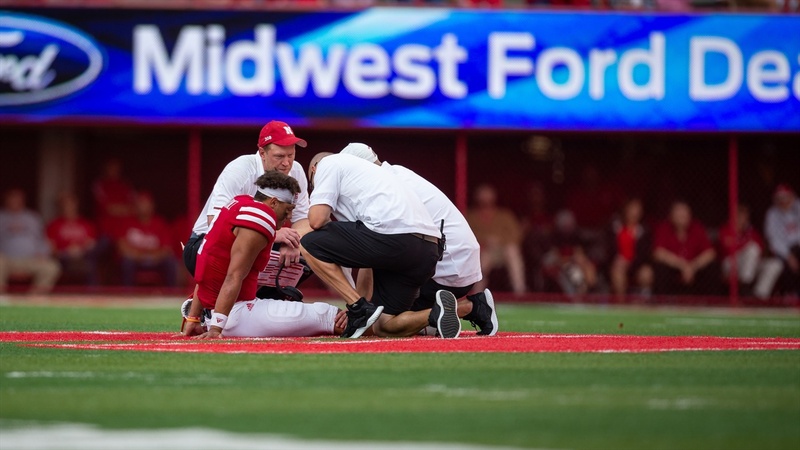 Nebraska got good news regarding the health of starting quarterback Adrian Martinez to start the week. “As good as news as we could’ve gotten,” head coach Scott Frost said of the diagnosis following Martinez’s examination Monday morning. Without going into additional detail, Frost said the result of a scan revealed no ligament damage. Now Nebraska will await news on the play that resulted in Martinez’s injury. After the Huskers’ 33-28 loss to Colorado on Saturday, videos started to pop up that some believe show a tackle with an intent to injure. Frost was careful not to say there was such intent on the play, but Nebraska has sent the clip to Big Ten and Pac-12 officials for review. Further review of the game film, presumably of the coaches’ film, prompted Nebraska to submit the play for review to the respective conferences. Though the prognosis for Martinez was promising, the true freshman did not practice on Monday. The Huskers will prepare backups Andrew Bunch and Matt Masker, both walk-ons, for Saturday’s game against Troy. Frost mentioned looking at a third option behind the two backups, likely true freshman cornerback Cam Taylor. A high school quarterback, Taylor’s name has been mentioned previously by Nebraska’s coaches as an emergency option following Tristan Gebbia’s transfer to Oregon State.